More from http://www.theuptake.org. Sat. 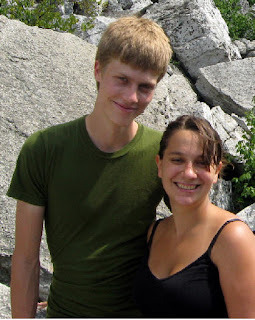 Aug 30, 2008. Saint Paul, MN Police Department raids a home at 591 Iglehart Avenue at gunpoint. The journalists include a contributing photojournalist with “Democracy Now”, whose host Amy Goodman appears in this clip jumping a fence to question police officers. 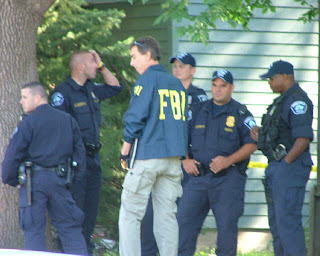 Today’s Star Tribune added that the raids were specifically “aided by informants planted in protest groups.” Back in May, Marcy Wheelerpresciently noted that the Minneapolis Joint Terrorist Task Force — an inter-agency group of federal, state and local law enforcement led by the FBI — was actively recruiting Minneapolis residents to serve as plants, to infiltrate “vegan groups” and other left-wing activist groups and report back to the Task Force about what they were doing. There seems to be little doubt that it was this domestic spying by the Federal Government that led to the excessive and truly despicable home assaults by the police yesterday. So here we have a massive assault led by Federal Government law enforcement agencies on left-wing dissidents and protesters who have committed no acts of violence or illegality whatsoever, preceded by months-long espionage efforts to track what they do. And as extraordinary as that conduct is, more extraordinary is the fact that they have received virtually no attention from the national media and little outcry from anyone. And it’s not difficult to see why. As the recent “overhaul” of the 30-year-old FISA law illustrated — preceded by the endless expansion of surveillance state powers, justified first by the War on Drugs and then the War on Terror — we’ve essentially decided that we want our Government to spy on us without limits. There is literally no police power that the state can exercise that will cause much protest from the political and media class and, therefore, from the citizenry. Beyond that, there is a widespread sense that the targets of these raids deserve what they get, even if nothing they’ve done is remotely illegal. We love to proclaim how much we cherish our “freedoms” in the abstract, but we despise those who actually exercise them. The Constitution, right in the very First Amendment, protects free speech and free assembly precisely because those liberties are central to a healthy republic — but we’ve decided that anyone who would actually express truly dissident views or do anything other than sit meekly and quietly in their homes are dirty trouble-makers up to no good, and it’s therefore probably for the best if our Government keeps them in check, spies on them, even gets a little rough with them. After all, if you don’t want the FBI spying on you, or the Police surrounding and then invading your home with rifles and seizing your computers, there’s a very simple solution: don’t protest the Government. Just sit quietly in your house and mind your own business. That way, the Government will have no reason to monitor what you say and feel the need to intimidate you by invading your home. Anyone who decides to protest — especially with something as unruly and disrespectful as anunauthorized street march — gets what they deserve. Isn’t it that mentality which very clearly is the cause of virtually everyone turning away as these police raids escalate against citizens — including lawyers, journalists and activists — who have broken no laws and whose only crime is that they intend vocally to protest what the Government is doing? Add to that the fact that many good establishment liberals are embarrassed by leftist protesters of this sort and wish that they would remain invisible, and there arises a widespread consensus that these Government attacks are perfectly tolerable if not desirable. Six Americans detained by police this week could be held for 10 days, according to Chinese authorities, who appear to be intensifying their efforts to shut down any public demonstrations during the final days of the Olympic Games. . . .
Chinese Olympic officials announced last month that Beijing would set up zones where people could protest during the Games, as long as they had received permission. None of the 77 applications submitted was approved, however, and several other would-be protesters were stopped from even applying. Behind the gray walls and barbed wire of the prison here, eight Chinese farmers with a grievance against the government have been consigned to Olympic limbo. Their indefinite detainment, relatives and neighbors said, is the price they are paying for stirring up troubleas China prepares to host the Beijing Games. Trouble, the Communist Party has made clear, will not be permitted. Would The Washington Post ever use such dark and accusatory tones to describe what the U.S. Government does? Of course it wouldn’t. Yet how is our own Government’s behavior in Minnesota any different than what the Chinese did to its protesters during the Olympics (other than the fact that we actually have a Constitution that prohibits such behavior)? And where are all the self-righteous Freedom Crusaders in our nation’s establishment organs who were so flamboyantly criticizing the actions of a Government on the other side of the globe as our own Government engages in the same tyrannical, protest-squelching conduct with exactly the same motives? Just review what happened yesterday and today. Homes of college-aid protesters were raided by rifle-wielding police forces. Journalists were forcibly detained at gun point. Lawyers on the scene to represent the detainees were handcuffed. Computers, laptops, journals, diaries, and political pamphlets were seized from people’s homes. And all of this occurred against U.S. citizens, without a single act of violence having taken place, and nothing more serious than traffic blockage even alleged by authorities to have been planned. They are still in custody. I’ve been told that the police have 36 hours to charge her, and that 36 hours starts after the labor day holiday, so they only have to charge her sometime Wednesday. It seems unlikely that they’d do anything to expedite her or Eryn’s release. They were then planning to actually board up her house for unspecified “code violations”, but apparently her neighbors were very vocal, and the police ended up agreeing not to do anything so long as the front door was fixed by 6pm (the front door they’d busted in). This is Eileen Clancy . . . The house where I-Witness Video is staying in St. Paul has been surrounded by police. We have locked all the doors. We have been told that if we leave we will be detained. One of our people who was caught outside is being detained in handcuffs in front of the house. The police say that they are waiting to get a search warrant. More than a dozen police are wielding firearms, including one St. Paul officer with a long gun, which someone told me is an M-16. We are suffering a preemptive video arrest. For those that don’t know, I-Witness Video was remarkably successful in exposing police misconduct and outright perjury by police during the 2004 RNC. Out of 1800 arrests, at least 400 were overturned based solely on video evidence which contradicted sworn statements which were fabricated by police officers. It seems that the house arrest we are now under and the possible threat of the seizure of our computers and video cameras is a result of the 2004 success. We are asking the public to contact the office of St. Paul Mayor Chris Coleman at 651-266-8510 to stop this house arrest, this gross intimidation by police officers, and the detention of media activists and reporters. That sounds like what it was: a cry for help from a hostage. Hours later, the Police finally obtained a search warrant — for the wrong house, one adjacent to the house where they were being detained — and nonetheless broke in, pointing guns, forced them to lay on the floor and handcuffed everyone inside (and handcuffed a National Lawyers Guild attorney outside). They searched the house, arrested nobody, and then left. Any rational person planning to protest the GOP Convention would, in light of this Government spying and these police raids, think twice — at least — about whether to do so. That is the point of the raids — to announce to citizens that they best stay in their homes and be good, quiet, meek, compliant people unless they want their homes to be invaded, their property seized, and have rifles pointed at them, too. The fact that this behavior is producing so little outcry only ensures, for obvious reasons, that it will continue in the future. We love our Surveillance State for keeping us safe and maintaining nice, quiet order. And Feministing has the video — here — of the scene yesterday where journalists were detained, along with an interview with the homeowner whose house was raided. Ralph Nader at the Open the Debates Rally, Aug 27 2008, Denver, CO.
LAKELAND, Fla. — Todd Bentley has a long night ahead of him, resurrecting the dead, healing the blind, and exploding cancerous tumors. Since April 3, the 32-year-old, heavily tattooed, body-pierced, shaved-head Canadian preacher has been leading a continuous “supernatural healing revival” in central Florida. To contain the 10,000-plus crowds flocking from around the globe, Bentley has rented baseball stadiums, arenas and airport hangars at a cost of up to $15,000 a day. Many in attendance are church pastors themselves who believe Bentley to be a prophet and don’t bat an eye when he tells them he’s seen King David and spoken with the Apostle Paul in heaven. “He was looking very Jewish,” Bentley notes. Tattooed across his sternum are military dog tags that read “Joel’s Army.” They’re evidence of Bentley’s generalship in a rapidly growing apocalyptic movement that’s gone largely unnoticed by watchdogs of the theocratic right. According to Bentley and a handful of other “hyper-charismatic” preachers advancing the same agenda, Joel’s Army is prophesied to become an Armageddon-ready military force of young people with a divine mandate to physically impose Christian “dominion” on non-believers. Read the rest of this entry ? From Edward Current Our Lord goes to extraordinary lengths to create the illusion that he does nothing. Why? Because he can do anything! You are currently browsing the OPERATION ITCH blog archives for August, 2008.